Kludge Audio’s new transformer‑ and inductor‑based modules could be just what’s needed to inject a bit of vintage vibe. Kludge Audio have their roots in location and studio recording, and they typically adopt a minimalist approach to miking acoustic performances — where possible, they’ll select a single pair of mics from their extensive and rather tasty collection, and configure them as Jecklin Disc, ORTF or Blumlein array, as the session requires. Over the years, Kludge’s Scott Dorsey has modified existing gear and developed custom equipment for his own use, and he found that many of his designs became popular projects in the pro‑audio DIY community. 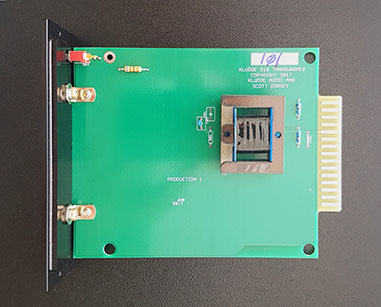 A couple have now become fully fledged commercial products under the Kludge name — the inductor‑based, three‑band 506 Equalizer and the decidedly minimalistic 510 Transwarmer, both of which are single‑width modules for the 500 series. As befits a unit designed by a working engineer, the 506’s front panel is dominated by a trio of large, dual‑concentric controls — and, without doubt, these are the easiest knobs to get to use that I’ve yet had the pleasure of encountering in this format. The outer ring of each has six detents, five of which select the filter frequencies in their respective bands, with the sixth switching the band out of circuit, whilst the centre‑detented inner knob controls the cut and boost for each band. A single toggle switch labelled ‘out’ bypasses the EQ section, although the signal carries on passing through the input and output electronics. The build quality in general is superb. The 506 has a thick, solid front panel, the switches and knobs feel as though they’ll last forever, and the internal circuit layout and components are all of a uniformly high quality, and it’s easy to see where the money has been spent. The three huge switch assemblies have a distinctly custom‑built air, whilst the custom multi‑tapped inductors that handle the middle and bass frequencies (high frequencies are handled by a simple low‑pass circuit) are two of the largest I’ve seen in a 500‑series module. In electronic terms, this is a negative feedback loop equaliser. Although originally developed in the late 1920s to help reduce distortion and other unwanted irregularities, negative feedback in an amplifier can also be used to modify its frequency response in a highly controllable manner, by placing equalisation components in its negative feedback loop. This circuit topology became popular in both mixing console EQ sections and external EQs in the early to mid 1970s. By the late ’70s, inexpensive active gyrator circuits were used to simulate inductors, and these now dominate EQ design. Although circuits based on simulated inductors cost less to implement, real‑world inductors often contribute significantly to the character, sound quality and behaviour of earlier equalisers in a way that simply can’t be simulated (not yet, at any rate). 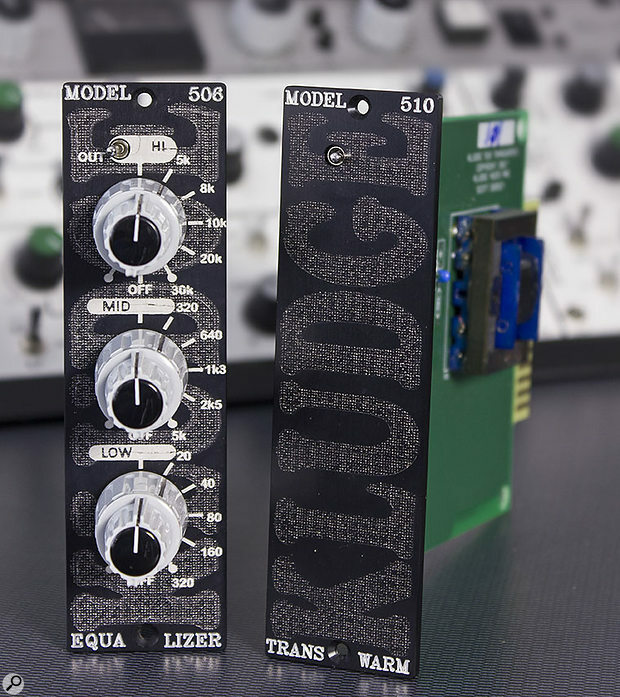 Hence the Kludge Audio 506, which Scott Dorsey describes as the EQ he always wanted — a 1970s inductor‑based equaliser that’s built to 2018 standards. Here you can see just how substantial the dual‑concentric switches are on the 506 EQ. The 506 high and low bands are shelving filters (the mid has a peak response), and Dorsey chose corner frequencies that he found most useful in his own work. According to the manual, the high and low shelves are designed with “a fairly wide slope”, and this leads to a not inconsiderable overlap between the three filter bands. This is intentional — the overlap enables the user to cut and boost within the same range, which is an effective technique if, for example, you want to add weight to a kick drum without increasing a track’s overall low‑end energy, or to add ‘air’ without boosting ‘presence’. The mid filter’s Q rises with the amount of boost or cut that’s applied (it does not vary with the signal level), thus tightening the focus at the selected frequency. The maximum boost or cut varies from band to band, and in the absence of written specifications Scott suggested an overall figure of “a whole lot” — and although I didn’t measure it, in practice, it sounds to me to be in the region of ±15dB. At the 30kHz setting, the treble filter has a corner frequency of 24kHz, so a +12dB boost at that frequency will also boost +6dB at 12kHz, producing a rising response in that top octave that can help accentuate the highest frequencies, to give a more open and airy feeling to some tracks. That’s a tactic that can become really addictive. (Do beware when increasing the level of ultrasonic frequencies too far with this or any other ‘air’ EQ; it’s all too easy to push the ultrasonic frequencies enough that your A‑D converter’s anti‑aliasing filters can’t do their job properly!) A final practical point to note is that, due to the amount of gain that’s available, the 506 can easily be driven into overload. But it has been deliberately designed to saturate “rather cleanly”; you might not notice a slight overload, and the manual recommends keeping a careful watch on your gain structure — but also overloading the 506 if you like the way it sounds. Using the Kludge Audio 506 is simple and intuitive. You just switch it into circuit, select the frequency in the band(s) that you want to work with and adjust the amount of cut or boost to taste. Although the range of frequencies chosen and the amount of cut and boost available enable you to perform corrective EQ in the mid‑range and to deal effectively with issues in both the high‑ and low‑frequency bands, it’s the overlap between frequencies from the broad filter slopes that opens up the musically creative tonal shaping at lower gain settings. To me, that is the whole point of an inductor‑based EQ such as the 506. And this particular specimen is as capable of enhancing or taming the mid‑range character of a signal as it is of delivering weight and warmth in the bass, or of adding air and space to the high end. Kludge’s other module, the 510 Transwarmer, is one of those deceptively simple ideas that makes one wonder why no‑one else has done this kind of thing before — ie. design a transformer that’s able to recreate the effect of the multiple transformers as found in the signal chain of a vintage console; make it with modern materials so that it’s smaller, more reliable and more affordable than the original; and put it in an entirely passive 500‑series module with a switchable 600Ω load resistor to avoid ringing when driving into modern, high‑impedance inputs. I The 510 Transwarmer is a rather simple affair!nterestingly, the 510 has also been designed to minimise the effect of signal volume changes on the coloration. 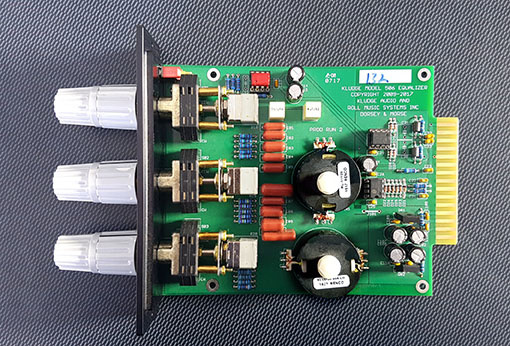 Since the transformer is permanently in circuit, you may well end up either patching it into a signal path in your 500‑series rack, inserting it into a channel or feeding it with an effects send. There’s something about the sound of good inductor‑based EQs and transformers in a signal path that, whether combined or taken separately, just work for me. That’s especially the case down in the bass, where EQ phase shifts, hysteresis‑induced waveform distortions and core saturations weave their magic, adding a sense of warmth and weight to the signals passing through them. The 506 is a great‑sounding equaliser whose frequencies seem to me to be especially well‑suited to working with acoustic instruments. I found the slopes of its shelving responses at 20 and 30 kHz to be effective at adding a feeling of space and openness as they progressively lifted the higher audible frequencies. Although the 506 will add colour to the signal to some extent, it nevertheless delivers a sound that seems clean and, at least given the context of it being an inductor EQ, essentially transparent. 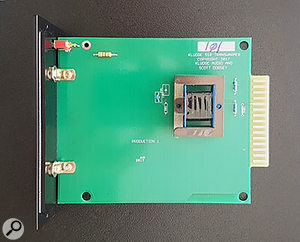 The 510 Transwarmer is another story. It sounded grand on the vocals, acoustic guitar and electrified archtop jazz that I tried it on, and I’d suggest that it can be used on anything — it’s a generally useful sound that doesn’t have a definitive character that restricts its usage, and if you like the coloration that a transformer can deliver, you’re going to love it. But it’s obviously intended primarily to be placed in the signal chain after the 506 EQ — and that produced a combination that instantly took me back to the 1970s, especially when combined with a suitably vintage‑sounding, transformer‑equipped mic preamp. I’ve got a real soft spot for studio equipment that’s borne of one person’s unique recording vision — and doubly so when that person has the technical skills necessary to bring their dream to market. And Scott Dorsey’s two units definitely tick the right boxes for me. If you’re looking for an effective EQ that will add some vintage character to your tracks, the Kludge Audio 506 is more than worthy of consideration. By the same token, if you’re looking for a great‑sounding transformer to add warmth and weight to your work you should definitely listen to the company’s 510 Transwarmer. 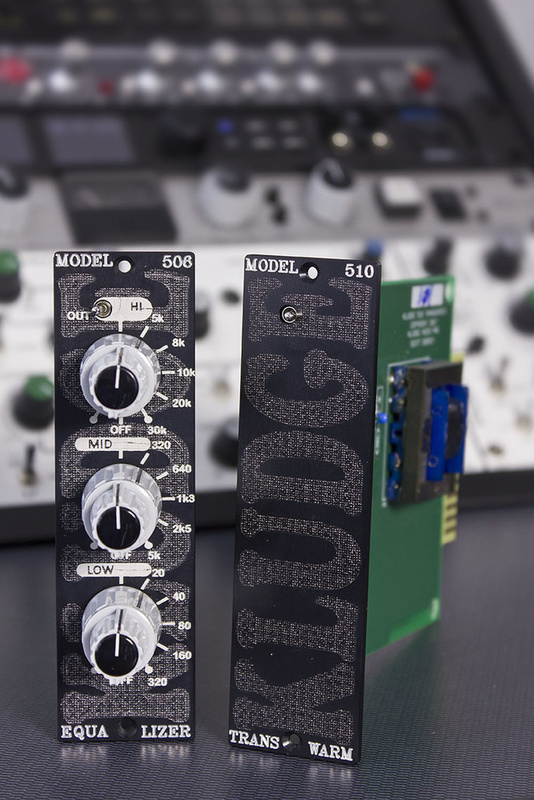 Compared with other high‑quality inductor EQs, the 506 represents decent value for money, while the Transwarmer’s lower price means it’s a real no‑brainer if you’re looking for a genuinely useful transformer sound. In the case of the 506, there are a few similarly priced inductor‑based EQs around, for example the Rupert Neve Designs 551, the Purple Audio Odd and Radial Engineering’s Q3. If you’ve got a bit more budget, the A‑Designs EM‑PEQ and Heritage Audio’s 73EQ JR will give you a taste of Pultec and Neve sounds. I don’t know of any direct equivalent to the 510 but, if you’re into the DIYRE Colour format, there’s the CTX Cinemag Transformer kit and Louder Than Liftoff’s pre‑built Mass Drivr American Console to consider. The 506 is a great-sounding, musical and very effective EQ. EQ corner frequencies are well-chosen and work well. Wide overlaps between EQ bands. EQ adds an attractive touch of vintage inductor character. 510 Transwarmer does exactly what it should — adds transformer ‘goodness’. 510’s sound character doesn’t alter with varying signal levels. Products of one man’s recording experience and vision, the Kludge Audio 506 Equalizer and the 510 Transwarmer are effective, great-sounding units that, singly or as a pair, will impart a sense of vintage warmth to signals passing through them. 506 EQ $799; 510 Transwarmer $249.